Paintless dent repair is a process which returns a car to “pre-dent” condition without damaging or adding paint. This method is by far the fastest, most cost-effective method of removing door dings, creases, and minor dents from your automobile or motorcycle without disturbing your vehicle’s finish. We can do the standard tinting on your vehicle. We can also do custom designed tinting. We have many designs to choose from or we can use yours..
As a customer you have the right to choose what repair facility is going to repair your vehicle! It is not mandatory that the vehicle should go to one of the insurance companies preferred shops, yes insurance companies have what is called DRP centers which is a Direct Repair Program when the shop works directly with the insurance company on the repairs to your vehicle but that does not mean your vehicle has to be repaired at that facility. At Extreme Custom Collision the owner of the vehicle is our customer not the insurance company; we will do everything we can for the customer to make sure your vehicle is repaired correctly and in a timely manner. That is our dedication to our customers . Broken windshield or car window? 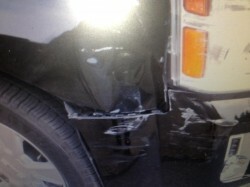 Trust the experts at Extreme Custom Collision with your auto glass repair and replacement needs. Detailing to create automotive masterpieces. – Isn’t’ time to give your car that “special” treatment that will make it look like new again? We are the masters in detailing. Bring in your vehicle and let us give it the “Extreme Custom” makeover it deserves. Whether you are looking for a simple pin stripping to enhance the lines of your car, truck, motorcycle, motor home….anything on wheels! We can do that. Or maybe you are ready for some “Extreme Custom” pin stripping to bring art to your wheels. 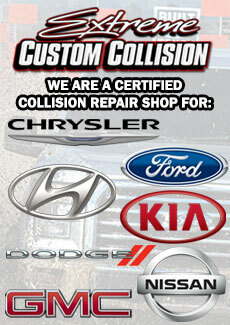 Call Custom Extreme Collision and talk to us about what we can create for you! Chrome work has been around for years, but the processes and quality has grown leaps and bounds. We are a high quality, chrome shop that can chrome anything! Chroming is not a process but a craft. Don’t get stuck with sub-quality chroming work, come to where you know the work being done is the best in the business! If you really want to put your stamp on the interior of your car, truck or anything with 4 wheels, call Extreme Custom Collision. We can “spruce” up your existing interior, or do a complete, from head to toe custom look. Your limit is only your imagination! Are you a proclaimed audiophile? So are we! So we know that are very few vehicles that come out of the factory with a satisfactory stereo system installed! We are you here for you! Stop by and see what kind of sound system we can install for you. Working with your needs and budget to find the perfect fit for you! Truck bed liners are going to reduce the wear and tear on the bed of your truck. As well as inhibit rust and corrosion. An investment in your truck that will give you back a return. Extreme Custom Collision can install a bed liner for your truck, to help extend the life of the hardest working part of your vehicle. We are now carrying Rhino Liners! Read More at our Rhino Linings of N. VA website. We have the accessories you need for your truck or SUV: nerf bars ™, truck steps, tonneau covers, truck bed covers, rubber bed mats, air intakes, air filters, fender flares, bedslides, bug shields, hitches, mirrors, grille guards, custom grilles, floor protection, truck racks, van racks, chrome accessories, ladder racks, mud flaps, running boards, and bike racks. Call us today and let us know what you need, we can install it! The work they did on my car, I just couldn’t believe it was the same car I brought into them. They not only met my expectations but far exceeded them! I will be recommending this company to everyone I meet! I brought my car in after I was at a competitors that gave me a quote, after they started in on the project the quote jumped up another $1000.00! I promptly took my car and came to Extreme Custom Collision after a friend told me about them. They not only did the work for slightly less than my first quote but stood by that number! They are the best!